This month we don’t just look back at a few news stories, but also ahead to what’s happening over the coming months for one of the most successful space missions ever: Cassini. 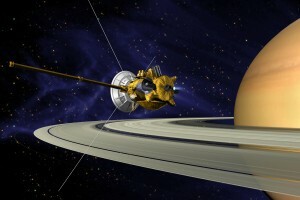 Having orbited Saturn for 13 years, Cassini’s fuel is running out and the mission has embarked on a “Grand Finale” before its final plunge into the planet’s atmosphere. Dr Leigh Fletcher, a planetary scientist at the University of Leicester, gives us a personal viewpoint of this groundbreaking mission to the ringed planet. We find out about a few of the highlights of the mission, as well as what’s in store for the spacecraft on its last few terrifying orbits. There’s also a look to the future, for whatever missions may come next to the outer Solar System. In other news, Edward and Chris discuss renegade black holes, newly discovered (potential) dwarf planets, possible future missions to the Moon, and how humanity is altering the Earth’s radiation belts. An extended edition of an original broadcast on 31st May 2017 as part of Pythagoras’ Trousers on Radio Cardiff.